LET'S QUASH A MYTH. World music queen Cesaria Evora is padding around her room in the Hilton Gateway Hotel in Newark, N. J., fielding questions during her third phone interview in an hour. It seems like a good time to ask the 58-year-old singer about the oft-repeated tale that she performs shoeless in solidarity for the impoverished women and children of her Cape Verde islands off the coast of Senegal. "No, no," she replies in her hauntingly rhythmic Portuguese-Creole and speaking through a translator. "In Cape Verde, where I lived, I was always barefooted. I walked down the street barefoot. I walked in the house barefoot. Ever since then, and now that I travel around the world, I stay mostly barefoot, though I wear little slippers sometimes so that my feet don't freeze in cold places. And very down to earth. During the past four years, Evora's soulful interpretations of her homeland's traditional morna songs have established her as a world-music sensation. Her 1995 self-titled debut snared a Grammy Award and topped the list of critics' favorites nationwide. Evora's newly released major label debut, Café Atlantico (RCA Victor), expands on her sound. The CD, recorded in France and Havana, features Cuban musicians and five arrangements by the Brazilian cellist Jacques Morelenbaum (known for his innovative work with acclaimed composer/performer Caetano Veloso). 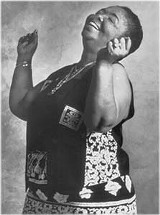 The 14 tracks include a tender bolero interpretation of the classic Spanish love song "Maria Elena," a version of "Beijo de Longe" set to the Cuban danzon rhythm, a rousing account of the Cape Verdean Mardis Gras favorite "Carnaval de São Vicente," and a haunting performance combining the African kora with Western strings on the sorrowful ballad "Desilsao dum Andjer." THE GRACEFUL POWER and soulful passion Evora displays on her recordings and in concert have spurred comparisons to Billie Holiday, Edith Piaf, and other legendary female vocalists. Evora grew up in Mindelo, a port on the island of São Vicente, known as "the Creole Rome," where passing sailors from Portugal, Argentina, Brazil, and the Caribbean left indelible marks on the local music. Her own musical inspiration comes mostly from the morna, a cousin to the blues sung in Cape Verdean Creole and blending West African percussion with Portuguese fados, Brazilian modhinas, and British sea chanteys. DURING COLONIAL TIMES, islanders often felt compelled to listen to Portuguese songs. After the 1975 independence of the Cape Verde islands, the local folk music scene underwent a revival. "Then we could listen and sing and express ourselves better through own music," Evora says. "I sing about colonial times. I sing about politics. Lack of rain. Lack of jobs. How people emigrate to other countries to better themselves. "That's how I express myself, through my music." Evora was drawn to the art form at age 16 and soon was performing throughout the Cape Verde islands. In the late '60s, two of her radio tapes were released as albums in the Netherlands and Portugal, but her dream of becoming a professional singer was never realized and in the mid-'70s she gave up music. Then, in 1985, she returned to the stage and traveled to Lisbon to record two songs for an anthology of female Cape Verdean singers. Three years later, producer Jose Da Silva, a Frenchman of Cape Verdean ancestry, invited her to record the album La Diva aux Pieds Nus (The Barefoot Diva). The project led to a long association, including four albums recorded between 1988 and 1992. Critics loved her. The French magazine Le Monde declared that Evora "belongs to the aristocracy of bar singers." As her fame grew, Evora launched her first U.S. tour in 1995. In America, she became an instant hit among the burgeoning legion of world-music fans, and recorded a track with Veloso on the 1997 Red Hot + Rio compilation. "They don't understand me very much, but I have a lot of fans everywhere I go," Evora acknowledges. "I guess they just like me." Why does she think her songs touch so many souls in foreign lands? "Music is just the universal language," she says. "Even if you don't understand the language, and I purchase recordings in languages that I don't understand, you listen because you like the rhythm of the song." Cesaria Evora performs Monday, Sept. 20, at 7:30 p.m., at the Luther Burbank Center, 50 Mark West Springs Road, Santa Rosa. Tickets are $20, $25. A pre-concert dinner costing an additional $28 will be served at 6 p.m. in the Gold Clubroom. For details, call 546-3600. From the September 16-23, 1999 issue of the Sonoma County Independent.